Bedbugs are small blood-sucking insects that crawl out at night and feed on blood, sometimes producing itchy red bumps one to nine days later. They are generally found in mattresses and bed frames; however, they can be passively transported in clothing, or in luggage and furniture. Once introduced into a building, bedbugs can spread easily from room to room. Most bedbug infestations usually only create problems between dusk and dawn when they come out of hiding in search of food. Bedbugs are generally found in mattresses and bed frames; however, they can be passively transported in clothing, or in luggage and furniture. All the insecticides we use are biodegradable and are of very low toxicity to people and animals. The Pest Control Officer will treat the affected areas residual insecticide will be used; when dried, this will be toxic to the bedbugs. Do not wash or vacuum the treated area for at least seven days, as this will remove the insecticide. Seeing one or two bedbugs after an area has been treated is very common. If a large number of bedbugs are still present after seven days, a revisit may be necessary for further treatments. Fleas are a common problem in homes especially for those with cats or dogs. They are also frequently found when moving into a home that previously had pets. They are generally found on pets, pet bedding and carpets. They will bite humans, causing an itchy swelling, but they do not live on the human. Fleas generally live in animals; however, they can also live in carpets, floors and soft furnishings. Fleas usually bite people when there are no animals to attack. It is possible that fleas can lie dormant in empty properties. All the insecticides we use are biodegradable and are of very low toxicity to animals and people. The Pest Control Officer will treat all soft furnishings and carpets of the affected premises if the areas have been cleaned and cleared. A residual insecticide will be used; when dried this will be toxic to the fleas. After treatment children and animals must be kept out of treated areas until dry. Do not wash or vacuum the treated area for at least ten days, as this will remove the insecticide. Seeing one or two fleas after an area has been treated is very common. If fleas are present after 14 days, a revisit may be necessary. The treatment is usually successful after one visit. If the fleas do recur and you have thoroughly treated your pet and home, there may be a secondary source. This could be a neighbour’s cat or bird’s nest within your premises. Please note that if further treatments are required, you must ensure that you are available at the address for all booked appointments. Cockroaches are large robust insects with whip-like antennae and two pairs of wings. The most common species found in the UK are the Oriental and German cockroaches. They prefer warm moist conditions of 20–33°C. As they are nocturnal, they spend the daytime hiding in cracks and crevices in areas such as sinks, drains, cookers, backs of cupboards, and around fridge motors. Oriental cockroaches can also be found in cooler and less humid conditions such as drains and basements. Cockroaches are large robust insects with whip-like antennae and two pairs of wings. The most common species found in the UK are the Oriental and German cockroaches. They prefer warm moist conditions of 20–33°C. As they are nocturnal, they spend the daytime hiding in cracks and crevices in areas such as sinks, drains, cookers, backs of cupboards, and around fridge motors. 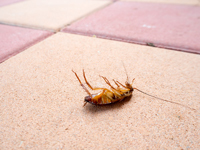 Oriental cockroaches can also be found in cooler and less humid conditions such as drains and basements. Several visits may be necessary for the treatment to be successful. Therefore you must ensure that you are available at the address for all appointments booked as part of the treatment. Treatment will be carried out by applying a residual insecticide paste to all affected areas, eg. behind the sink unit, around fridge motors, washing machines, skirting-boards, waste pipes and small cracks/crevices in the structure. Cardboard monitoring traps may be used to identify the volume and type of cockroach and inform how successful the ongoing treatment is. A high standard of hygiene isextremely important as this will deny the insect food. To reduce the risk of harbouring cockroaches, all cracks and crevices should be sealed, particularly in food preparation areas. Wasps can be a nuisance during warmer weather in the spring and summer months. They have a potent sting and can attack in large numbers if disturbed or threatened. If stung the sting left in situ is irritating and in some cases will cause medical issues. If you are experiencing high numbers of wasps in your home or garden it is likely that there is a nest nearby. If the location of a nest is likely to put people at risk, then it should be treated immediately by a professional pest controller. Wasps can be a nuisance in summer, particularly late summer, and are not regarded as being aggressive. They sting to defend their nests and if they do sting humans or animals, it is usually due to the fact that they have been disturbed in some way. The Pest Control Officer will dust the nest or entry point using an insecticidal dust. The treatment is very quick and very effective. After the treatment there will be a significant amount of activity around the nest for three to four hours. The wasps should be completely eradicated within 48 hours. If the nest is active after this time, a revisit can be arranged. Once the wasps have been eradicated the nest will not be used again. We do not remove the nest as it is made up of paper pulp and will not cause any damage. Rats or Mice in your property tend to be found where there is a food source and moisture. The food source could be in your cupboards, waste bags on the floor, pet food left out or leftovers. Rats carry viral and infectious pathogens which are left upon surfaces they move across. Rats and mice are found where food, water and shelter are available for them. Rats usually live in drains and sewers and may only be visible if the drainage system becomes damaged. If this is the case, repairing the fault is important. Mice can enter buildings from very small gaps (gaps small enough to insert a pencil into). It is important to block or seal all gaps as they may be entry points for mice. The Pest Control Officer will place small trays or boxes of rodenticide poison in any affected areas. The rodents may not eat the bait straight away, so to ensure that rodents eat the poison, all rubbish and food waste should be removed. We also advise that garden birds are not fed during the treatment, as this is a food source for rodents, and dog/cat food should be removed after feeding pets. Bins and skips should be kept covered. As rodents require water, any leaks should be repaired. Once the rodents have taken the bait, they may die in an inaccessible place and as their bodies decompose, this may result in an unpleasant smell. On completion of your treatment all materials and rodenticide will be removed from your property where recoverable. Please ensure that any visitors to your property are informed of bait locations, especially those with children or pets. Please note that the treatment may require several visits for it to be successful, so you must ensure that you are available at the address for all booked appointments. It is important that you do not move or interfere with any of the poison baits. Due to the vital role of bees in the pollination of crops and the serious decline in the UK’s bee population, we don’t generally treat them as a pest. If you’d like guidance about keeping bees, or general information, you should contact the Bee Keepers Association (BKA). Please note that the BKA very rarely relocate swarms due to the risk of cross-hive infection. Got bees? Check if they’re honeybees or bumblebees and get advice on what to do with them. We do treat Wasps but we only treat bees if there is a serious risk to public health, children, older or vulnerable people, or where there is a current medical history of anaphylactic shock. As a landlord or agent, a discreet pest control service is essential. For example, if a new tenant discovers an infestation of fleas or other vermin, a landlord may find themselves in breach of the tenancy agreement. Should the tenant move out, a landlord is not only left with the cost of treatment but also the vacant cost and the cost of re-letting the property. Buzz Bees Pest Control can provide a pest control service to remedy the situation as quickly and efficiently as possible with the interests of both landlord and tenant in mind. If you wish, we can liaise directly with the tenant direct. 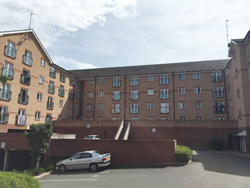 Our experience ranges from providing comprehensive pest cover for Block Management Companies, Contracts to cover the communal areas of a city office building to a block of flats providing regular inspections keeping records making sure they are pest free.